While industry gatekeepers were invested in a specific image of black performance, black performers themselves had different ideas. Somewhere along the line, it became received wisdom that the blues is as real as it gets. No phony-baloney artifice here, no show-biz finery. No giving in to poppy or schmaltz trappings. Just a singer, 12 bars, and the truth about hard times. Of course, that’s a major over-simplification of how things actually went. In fact, in recent years we’ve learned more about how much that trope was actually a distortion of the growth of the blues (I took a look at that work in this space in 2008). 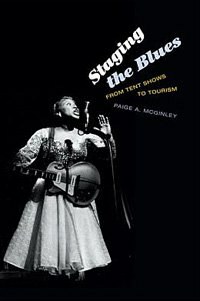 Paige McGinley’s Staging the Blues advances that corrective scholarship by centering our focus on the pioneer women of blues performance, and how their world got all but written out of the “official” blues creation myth. It may be odd to think that singers like Ma Rainey and Bessie Smith ever got written out of anything. Not only were they great singers, they were also outsized personalities. Their influence looms over every black woman singing blues, jazz or R&B today. They were also versatile performers, known for their regal and theatrical regal live performances (McGinley notes they were often characterized as “actresses” as much as “singers”). But McGinley argues the milieu of those performances was sidestepped as the marketing and packaging of the blues took hold, even as that milieu continued to influence black entertainment for years. That milieu was the tent show, a traveling entertainment revue that brought music and comedy to rural audiences throughout the South in the early decades of the 20th Century. Rainey was a star of this circuit, well before she ever set foot in a recording studio. And she didn’t just step out on the stage and belt out tunes. She performed them, employing comedy and costume to flesh out her show. McGinley also explores how Rainey and Smith were invested in shaping their public image beyond the stage and recording studio. She expands at length about Smith’s mid-‘30s sessions with culture maven-turned writer-turned photographer Carl Van Vechten, which generated pictures that were anything but “bluesy”. They underscore the freedom early blues women took to craft their images, an approach that gained less “official” respect and prominence as the rural blues sound took center stage (but resonates today in the shapeshifting looks pop artists from Madonna to Nicki Minaj have adapted from video to video). The songs Rainey and her circuit peers (mostly women, McGinley notes) performed bore much closer resemblance to the black pop emerging from vaudeville-minded songwriters than the harder-edged acoustic instrument stylings (although they drew freely from all sources in putting together their repetoires). Let’s remember that the first blues music to be recorded was one of those concoctions, Mamie Smith’s “Crazy Blues” (1920). Its success fueled a wave of black women making similar records, including eventually Rainey and Smith. It would be four years before a black man recorded blues music, but the style of blues Papa Charlie Jackson played on those Paramount sides of 1924 came to be seen as the authentic representation of blues music, not what the blues women were doing. (McGinley also touches upon how records, not performances, came to be seen as the accepted documentary evidence of the blues’ evolution). By the '30s, an artificial distinction had become accepted between the rural, or “downhome” blues than men with guitars sang, and the theatrical, or “vaudeville” blues that Rainey, Smith and the other blues women sang. The former came to be seen as more authentic to the true blues essence, at least by the recording companies, marketers and song collectors who had become the blues’ de facto gatekeepers. By contrast, the women of the blues, with their gaudy stage shows and outsized personas, were seen as too beholden to their onstage image and presence to represent anything in a “pure” form. McGinley shows how that played out in her long exploration of Huddie Ledbetter’s life and career. Anyone familiar with blues history knows the parameters of Leadbelly’s story: discovered in a Texas prison by folklorist John Lomax, brought to a mass market but told to adhere to that “downhome” masquerade even though his music was far more than just that, and eventually ditching Lomax’s operation. McGinley expands upon that history in a lengthy chapter, pointing out how Leadbelly was forced to stuff his song-and-dance roots in the background largely because of Lomax’s ambivalence towards theatrical performance of the blues (even though Lomax was something of a performer himself, giving lectures about his musical discoveries). Ledbetter’s career suggests that while industry gatekeepers were invested in a specific image of black performance, black performers themselves had different ideas. McGinley briefly touches upon how the legacy of tent shows resurfaced in entertainment packages at Harlem’s Apollo Theater, and how some rural blues musicians navigated working in mainstream theater and progressive political circles. But while they were able to carve out some artistic license within those opportunities, the central image never departed from that of a broke-down black man in overalls singing from some dilapidated shack in the middle of the Mississippi Delta. In the second half of Staging the Blues, McGinley shows how pervasive that image became. It was the central motif ofThe Blues and Gospel Train, a 1964 British TV special that capitalized upon the long-building interest of English youth in American blues (and was actually performed in an abandoned railway station). And it became the inescapable mise en scène of 21st century blues tourism in the South, with pilgrims invited to sample the life of rural blues musicians as it presumably really was (of course, without having to deal with Jim Crow or other such nuisances). Previous revisionist tellings of blues history point out, in greater detail than does McGinley here, how malleable the lines of demarcation actually were in the eyes of the performers themselves (readers whose curiosity is piqued will want to consult more comprehensive histories of the evolution of black performance). But she does a worthy job of explaining how the dominant framing of the blues essentially assigned the very notion of theatrical performance – and, by extension, a performer’s right to develop a stage presence of his/her own choosing – to a gendered, second-class status. The irony turns out to be that said framing was itself a theatrical construct in the first place.